Lithuania is a democratic republic. The Lithuanian president, the head of state, is elected by direct popular vote for a term of five years and may serve a maximum of two consecutive terms. The president formally appoints a prime minister, the head of government, who must be approved by parliament. For administrative purposes, the country is divided into ten counties. The capital is Vilnius. The ancestors of Lithuanians came to the Baltic area most likely around 2500 BC. The first reference to them by name was in 1009, in a medieval German manuscript, the Quedlinburg Chronicle. With the rise of the medieval lords in Germany and Russia, Lithuania was constantly subject to invasion and attempted conquest. In the 13th century, when the Teutonic Knights, a German militaristic religious order, were establishing their power, the Lithuanians resisted. The various Lithuanian tribes united to form a loose federation under pagan chieftain Mindaugas. Mindaugas was baptized as a Christian in 1251 and subsequently crowned king of Lithuania under the authority of Pope Innocent IV. In 1263 Mindaugas was assassinated, probably by pagan Lithuanian princes, and Lithuania officially reverted to paganism. In the 1300s Mindaugas’s successors began to expand their realm by incorporating, through conquest, Slavic lands to the east and south. 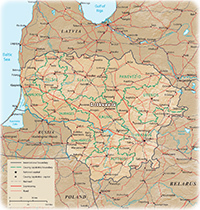 Under Lithuanian ruler Gediminas, the empire was expanded in the south to include most of present-day Belarus, and Vilnius was established as the capital. Lithuanian grand duke Algirdas then expanded the Lithuanian realm east toward Moscow and south to the Black Sea. In 1386 Grand Duke Jogaila joined Lithuania in a dynastic union with Poland when he married Polish queen Jadwiga. Jogaila accepted Christianity, becoming a Roman Catholic, and was crowned Władysław II, king of Poland. Lithuanian culture is noted for its vibrant oral tradition, consisting of folktales, legends, proverbs, and dainos (ancient songs). The country’s national literature began with the long poem Metai, by Lutheran pastor Kristijonas Donelaitis, written in the 18th century and published posthumously in 1818. Another early literary landmark is the poem Anykščiu šilelis, written in 1858 and 1859 by Antanas Baranauskas. 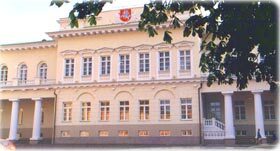 For the last four decades of the 19th century the Russian tsar, concerned with nationalist uprisings, banned printing in the Lithuanian language. The country’s official language since 1988 has been Lithuanian, a language of the Baltic branch of the Indo-European languages. The Lithuanian language is closely related to Latvian. Other languages spoken in the country include Russian and Polish. Lithuania has about 3,000 small lakes and many rivers. The country’s longest and largest river is the Nemunas (Neman), which flows north from Belarus to the center of Lithuania, and then west until it reaches the Baltic. Façade of the Presidential Palace in Vilnius, Lithuania (photo www.president.lt).